The Clinic for the Rehabilitation of Wildlife is a teaching hospital and visitor education center dedicated to saving wildlife through state-of-the-art veterinary care, research, education and conservation medicine. CROW's Visitor Education Center (VEC) offers behind-the-scenes views into CROW's animal care through live camera feeds, interactive displays and daily presentations by students, staff and volunteers. Each year, CROW cares for approximately 3,500 wildlife patients including more than 200 species of sick, injured and orphaned wildlife in its veterinary hospital, which is one of the nation’s leading rehabilitation facilities for native and migratory wildlife. CROW offers educational fellowships and externship programs for undergraduate students, and internship programs for veterinarian graduates. Volunteers are the cornerstone of CROW and each year more than 200 volunteers dedicate thousands of hours helping rescue, care for and rehabilitate wildlife. CROW accepts all native wildlife in need of care including migratory birds. CROW employs a full-time veterinarian who is Board Certified in avian medicine and surgery with a number of years' experience working with wildlife and experienced wildlife rehabilitators. CROW offers immediate on-site critical care such as pain management, surgery and radiography, while also providing for long-term rehabilitation. CROW offers a student program unique in its scope, with opportunities for college-age or older students at all levels of learning -- including veterinary interns. 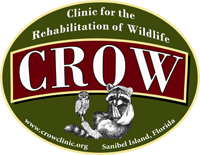 CROW has a high case-load with a rich variety of wildlife species not encountered at many other rehabilitation centers. CROW has served the wildlife of Southwest Florida for almost 50 years. In 1968, shortly after the Sanibel Causeway was built, islander Shirley Walter found a Royal Tern which had been hit by a car on the causeway. Finding no services available for injured wildlife, Shirley took the bird to her Sanibel home. A small group of volunteers joined Walter, and CROW was born. In the first year, 500 distress calls were answered. From the beginning, the late Dr. Phyllis Douglass provided veterinary assistance. Wildlife medicine was in its infancy in the 1960's so Shirley, the volunteers and Dr. Phyllis all learned together, with the network of rehabilitators around Florida. In 1972 CROW incorporated as a non-profit organization, receiving their 501 (c) (3) IRS exemption in 1973. The name was Shirley’s idea – she wanted a bird’s name, a W for wildlife and she considered crows intelligent – the CROW acronym was born. Forced to close down in 1976 by new city ordinances, CROW existed in name only for one year. In 1977, the late Adelaide Cherbonnier offered her Captiva home as a temporary location until CROW was given 10 acres of the Sawbridge tract along Sanibel Captiva Road. With a $35,000 mortgage to build its facility, CROW won city approval and the wildlife clinic became operational in 1981. CROW founded and operated from Shirley Walter’s West Rocks Sanibel home. CROW incorporated as a 501 (c)(3) organization. City of Sanibel was incorporated. CROW closed at Shirley’s home; 88 different wildlife species were seen. CROW existed in name only and the search for a new location began. Moved to the Captiva home of Adelaide Cherbonnier. Obtained 10 acres of Sawbridge family property on Sanibel Captiva Road. Raised funding and constructed the original clinic building with a third floor apartment and moved into the new location from Captiva. Staff housing opened with three rooms; two rehabilitators live on-site. VERT (Volunteer Emergency Rescue & Transport) program instituted. Hired first veterinarian; installed surgery room; X-ray machine, hand tanks for developing films; stainless steel cages in clinic; Student Extern program began. Original Robert E. Schneider Education Pavilion built; Daily educational programs began. “Commitment to Compassion” capital campaign begun; Hurricane Charley devastated Sanibel and Captiva; CROW student housing destroyed; added Associate Veterinarian position. Student program continued uninterrupted; Remote housing provided by friends of CROW. The George E. Batchelor Student Housing completed and occupied by students. Construction of the Visitor Education Center and hospital began. CROW treated 164 different species and a record number of patients. CROW celebrated its 40th anniversary with the opening of a new state-of-the-art veterinary hospital and the 4,800-square-foot Healing Winds Visitor Education Center. The Visitor Education Center (VEC) features innovative visitor displays, interactive exhibits, live patient videos, wildlife presentations and special events. Proceeds from an on-site gift store benefit patient care. CROW’s wildlife hospital includes diet preparation areas, a laundry room , reptile room, pediatric ward and surgery room with a viewing window. In addition to treating more than 4,000 patients, CROW unveiled renovated sea turtle facilities and announced several new ventures to more effectively share news and success stories with supporters. In addition to introducing a new e-newsletter, the organization launched a new website that more fully highlights the range of educational programs and services offered. CROW also implemented wildlife partnerships to better educate the public about saving wildlife through compassion, care and education. CROW began its Animal Ambassador program to provide an educational home for animals who are unable to be released into the wild. These animals are used during presentations and programs for an up close experience with wildlife. CROW received recognition and first place distinction from the EPA’s Gulf of Mexico Program. CROW won the award for its role in protecting and caring for wildlife native to the Gulf region and toward achieving and preserving healthy and resilient coasts in the states bordering the Gulf of Mexico. Live cameras or "Critter Cams" in the hospital intake room and patient enclosures are upgraded. These cameras are viewed in the Visitor Education Center and live streamed on CROW's website. Initiated specialty programs including Wildlife Walks, Lunch & Learn, and a yearly Speaker Series. Established an Endowment Fund for the purpose of providing a self-sustaining source of funding. Introduced live animal exhibits to the Visitor Education Center. These exhibits are designed to teach visitors about the impacts invasive species can have on our native and migratory wildlife.